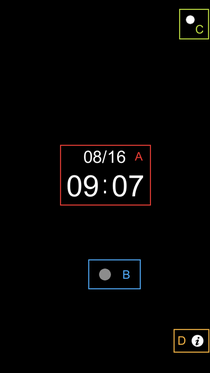 Blink Clock is a clock application that models the blinking light. It is very convenient if you want to display a big clock with the iPhone.In addition, the date and time display to represent only blinking of light are also available, making it suitable for the case we might want to use the clock different from others. A：現在の日付と時刻を表示します。Will display the current date and time. B：一秒間隔で点滅を繰り返します。Repeat the flash at one-second intervals. 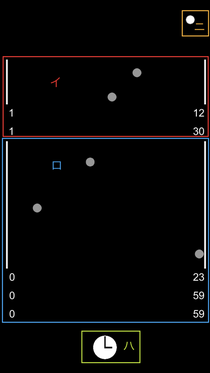 C：Blink Clockモードに切り替えます。Switch to "Blink Clock"mode. Represents the current date. I mean month, and day from above. In the case of the 31st, the day is to enter the vertical line to a point. Represents the current time. When from the top, minutes, I mean seconds. Date and time will be displayed for five seconds currently When you tap. Please use it if you want to know the exact date and time soon. Switch to "Normal Clock" mode.